Home > Hinduism > Hinduism Practices > Ritualistic Worship of God (Dev Puja) > How does the growing of Tulsi help in making premise pleasant? 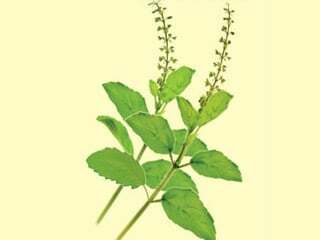 How does the growing of Tulsi help in making premise pleasant? A premise (vastu) refers to an open space enclosed by four walls irrespective of whether it has a roof. The presiding deity of this place is called the deity of the premise. Frequencies within a premise are not perceived outside it. For instance a subtle fragrance in a room is not experienced outside the threshold of that room. Other Names: Vastudev, Vastupurush. The earth is the consort of the Vastupurush. The deity of a premise is the centre of energy of the premise. Its mission is to endow energy to any pleasant or distressing event occurring there. It is believed that the deity of a premise says, ‘So be it (tathastu)’ to whatever is uttered there. Hence one should not utter abominable words in the house. A. Frequencies arising from the floor of a premise ascend towards the sky. Frequencies emitted from land shaped like a cow’s mouth (gomukhi), a tiger’s mouth (vyaghramukhi) or a donkey’s mouth (gardabhamukhi) correspond to the shape and its basic qualities. B. The ‘360 frequencies’ travel in a premise in a circular fashion. C. Frequencies due to thoughts of those constructing the premise, those visiting and residing in the premise, strike the walls and ceiling and get dispersed everywhere. Refer to numbers 1, 2 and 3 in figure ‘A’. A. The magnetic field: Any wall of a plot or a house should be facing north-south like the pointer of a compass. Land influenced by the moon: The distance between the northern and southern borders is more than that between the eastern and western borders. This land brings fortune. Akin to the Moon channel (Chandra nadi) it bestows tranquility. Land influenced by the sun: The distance between the northern and southern borders is less than that between the eastern and western borders. This land brings misfortune. Like the Sun channel (Surya nadi) it brings distress. The mouth of a cow: The entrance to this plot of land is narrow while the hind part is broad. This land bestows opulence and mental peace. The mouth of a tiger: The entrance to this plot of land is broad while the hind part is narrow. This land torments and destroys the owner. E. Adjacent land: A small plot of land between two large plots causes distress because frequencies of the bigger plot affect the smaller one markedly. 7. If the south, west, south-west and north-west directions have ascents then that land is called the back of an elephant (gajaprushtha). This land is perpetually inhabited by deity Lakshmi. 8. When the land has an ascent in the centre and a descent in all other directions, the land is called the back of a tortoise (kurmaprushtha). This land always bestows opulence. 9. If the land has an ascent towards the east, south-east and north-east and descent towards the west it is referred to as the back of a demon (daityaprushtha). Such land is always poverty-stricken. 10. If the land is longer in the east-west direction and there is an ascent between the north and the south then it is called the back of a serpent (nagaprushtha). Here fear of death is imminent. G. Other physical aspects: Land which has ascents and descents, is thorny, has a polluted atmosphere and distressing surroundings proves distressing. A road leading to a plot of land and ending before entering it is called vithishula. However if it turns instead of terminating then it is not called so. Preferably one should not choose a plot of land with an ascent. I. Land on a mountain: Terrain at a high altitude can prove problematic. There can be shortage of water. J. Temples: A temple should not be located opposite or close to a plot of land because the sattva component from it can make the raja predominant individual living there sattvik (sattva predominant). If this happens he could face losses in business ! However for a seeker a temple certainly proves beneficial. K. Rivers, lakes and ponds: If a river or a well is situated in the north-eastern part then it is favourable. A continuous flow of water opposite the main door of the house causes loss of wealth. Open gutters too cause problems. A well should be situated behind and not in front of a house. Lakes or ponds should not be situated in the middle of a plot of land because if subordinate deities like the seven asaras come to inhabit it, then distress is experienced. L. Trees and pillars: Since there are chances of spirits living on trees and pillars these should not exist opposite a house. M. Hillocks: If a hillock is situated to the south-west then it is ideal. However if it is situated in the north-eastern direction then it causes spiritual descent. N. Crematorium: If a crematorium is situated close to a dwelling then the spirits from there, sorcerers (tantriks) visiting it, etc. may be the cause for distress. If a road, tree, pillar, well, temple, rotating wheel (e.g. a water wheel), etc. are situated at a distance of more than twice the height of a premise then they are harmless. O. Miscellaneous: Materials (such as bamboo, cement, etc.) used in construction, position of the tulsi plant in the courtyard of the house, the neighbours, etc. also affect the frequencies in a premise. Just as frequencies in a particular room of a house can be distressing so also frequencies in a particular region of a city can be so. This makes one thing clear that instead of performing the ritual of Vastushanti after construction of a house it would be wiser to consider the above factors before building it or arranging the furniture in it. Similarly it is important to decide what to build on which plot, for instance a school, a factory, etc. 1. Dig a small pit in the ground and fill it with water completely. If after approximately an hour water still remains in the pit then it is auspicious. Wealth is generated in that premise. If no water remains then the potential of the plot is moderate. 2. Throw a small fragrant flower into the pit and pour water over it. If the flower continues to float and moves around then the land is auspicious. 3. Fill the pit with the same mud dug from it earlier. If some mud remains after filling the pit then the land is auspicious whereas if the pit is not completely filled with that mud then it is inauspicious. 4. Take a dog to the plot and let it loose. If the dog barks persistently or roams around sniffing the ground then the land is inauspicious. 5. When walking on the plot if a small child falls down or cries continuously then the plot is inauspicious. On the other hand if the child plays continuously or moves around happily then it is auspicious. 6. Land inhabited by animals like rabbits or mongooses is good while that inhabited by wild animals like tigers and lions is bad. Subtle: If it is possible to consult someone who perceives subtle frequencies then one should listen to him. Then one need not consider the above gross factors. Thus when buying a plot of land one should choose one which is basically good. If when buying it, adjustments in measurements, etc. are made deliberately to fulfill the above criteria then it does not prove beneficial. A. Material used in construction: Frequencies generated in a premise depend upon the building material such as stone, mud, cement, etc. used. Stone and mud have a greater potential to attract pleasant frequencies than cement. The main door should preferably face eastwards, not southwards. The main door should be attractive and well decorated. The doors in a house should be even in number. The other doors should be shorter and of a lower quality than the main door. The doors should not be broken or infested by termites. The main door should be decorated with auspicious symbols such as Om, Shri, svastik, the auspicious pot (kalash), etc. drawn with a mixture of turmeric, vermilion (kumkum), urine and dung of a cow. This prevents distressing energies from entering the house. Rangoli (designs with powder of soft, white stone) drawn in front of the door also bestows the same benefit. C. The kitchen: This should face the south-east direction since it is the direction of Agni, the deity of fire. If situated in other directions the problems which may have to be faced are enumerated below. To avert problems caused by such faulty directions the placement of rooms in the house should be as follows. Meaning: The temple in the house should be situated to the north-east, the bathroom to the east, the kitchen to the south-east and the storeroom to the north. D. The toilet: It should be situated to the south. E. Premises in the context of cities: In a city the presidential mansion should be situated in a prominent place towards the north-west of the city. Neither idols nor the description of this deity is available. 1. A house, 2. A palace, 3. A hermitage (math), 4. An auditorium, 5. A godown, 6. A city with shopping centres, lanes, etc. According to this science the deity of a premise is referred to as the Vastupurush. In this context Vastupurush means the soul of the premise. It manifests in a specific gentle manner and has nine sensitive points. They should not be traumatised, that is appropriate frequencies should be present there. Mandal refers to an outline or a heavenly (subtle) design. The territory of a deity of a premise (vastupurushmandal) is constituted by the land, the deity of the premise and the mandal. In other words it is the imprint of demons who have fallen on the ground. (Generally since a premise is raja–tama predominant the form of energy in it is akin to that of demons, not deities.) In the text Taittiriya Sanhita this is termed as ‘yadnyatanu’ meaning the body (tana) of the sacrificial fire (yadnya). 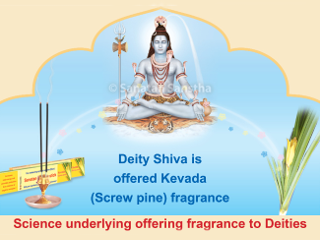 It is also termed as the Universal Being (Vishvapurush). From the architectural point of view the territory of a deity of a premise has the following three layers. Absolute ether in a pot (ghata akash): The space enclosed in a vessel. The human body has also been referred to as a vessel. These three layers of absolute ether should be concordant and proportionate. Ultimately the space taken from the great absolute ether, that is the house where one lives and works should have a definite proportion. When constructing a premise the class of the person who is going to live there should also be considered. For example a premise proves favourable to a Brahman (priest) if it generates sattvik (sattva predominant) frequencies while for a Kshatriya (warrior) if it emits rajasik (raja predominant) ones. If a visitor feels uncomfortable in someone’s house one can infer that at that point of time that premise is impure or that the resident of that house has been troubled in the past or will undergo severe distress in the future. Distressing frequencies are experienced in a hospital, police station, prison, a place where evil transactions are carried out, a place where a murder has occurred, a crematorium, etc. because the individuals there are either unhappy or with evil attitudes. A. Physical illnesses such as disorders of the stomach, rheumatism, paralysis, etc. B. Psychological problems such as anxiety, depression, etc. A. The ritual of entering a plot of land (bhukhandpravesh vidhi): After buying a plot of land, that is after one procures the document of its legal ownership before entering the plot as its owner one should wholeheartedly offer obeisance to God using fragrant flowers, in the north-eastern direction. Thereafter circumambulating the entire plot one should enter it through the main entrance touching the right big toe to the ground. Such an entry is beneficial. B. The ritual of Vastushanti: ‘Ritualistic worship of a premise performed to appease the deity of the premise (Vastupurush) and to make the constructed house propitious to the owner with respect to longevity, health, overcoming obstacles, wealth, etc. is called Vastushanti.’(1) During this ceremony sixty-four yoginis are installed in the vastumandal. Assuming that the deity of the premise is masculine various deities have to be installed in different parts of its body. During the worship, in the centre of the vastumandal, in the south-eastern direction of the house, in a large room a pit is dug and a box in which seven types of food grains, a mixture of rice and curds, flowers, moss and an idol of the deity of the premise are placed, is buried in it. Thereafter at a predetermined auspicious moment (muhurt) the house-warming is performed. The gold or copper seal of the deity of the premise buried during the ritual of Vastushanti attracts frequencies which ascend through the floor of the house. As shown at number 1 in the figure below they unite at the deity of the premise and from there gain momentum as they are emitted collectively. That is why the ‘360 frequencies’ (as shown at number 2 in the figure) and frequencies of human thoughts (as shown at number 3 in the figure) travel rhythmically in a particular fashion in the premise. This converts the chaotic ‘noise’ generated by frequencies to ‘sound’. Thus these frequencies prove to be pleasant and are endowers of happiness and propitiousness. Substances buried in the ground are referred to as nikshep. During the ritual of Vastushanti the idol of the deity of the premise is buried in the south-eastern direction. (When performing a ritual called Sthiralakshmi some people bury the idol, coins, etc. in the western direction.) ‘One should take care to see that the site of burial of the deity is not littered with garbage. The custom of paying obeisance to the deity of the premise during ritualistic worship should be observed. Whenever possible throughout the year ritualistic worship in five (panchopchar puja) or sixteen steps (shodashopchar puja) should be performed. On the day that the ritual of Vastushanti is performed the house should not be kept closed. One should stay there for some days. Ritualistic worship of the premise should be performed every ten years. At that time excluding burial of the deity of the premise, all other rituals should be performed. ‘The Matsya Puran (265.10/11) quotes that in the context of a house, a fire sacrifice of a premise (vastuyadnya) needs to be performed under the following five circumstances – 1. When laying the foundation of the house or planning the construction, 2. When raising the first pillar of the house, 3. When fixing the first door, 4. During the house-warming ceremony (Gruhapravesh), 5. When performing the ritual of Vastushanti to ward off evil or distressing energies. D. The personalities of residents in a premise should be pleasing. If not they should improve themselves. 30% of the defects in a premise occur on account of the residents themselves. E. Keeping the doors and windows open: The innermost sanctified room of a temple (gabhara) has no windows and even its entrance is very small. This is to prevent the pleasant frequencies inside the temple from escaping. Contrary to this in the present Kaliyug since in most families there are conflicts, to facilitate the escape of distressing frequencies created thereby it is advisable to leave the doors and windows open. One will be able to appreciate easily the distress experienced by staring at any of the walls in a house. F. Substances possessing distressing frequencies or those which attract distressing energies should not be kept in the house, e.g. a black doll. G. One should neither perform experiments such as the planchet with the help of subtle bodies nor of any distressing subtle energies as sometimes the subtle bodies or distressing energies might remain in the house. If at all one wishes to perform such experiments they should be done in the open air. H. Eliminating defects in a premise: First look at each of the figures given below for a minute each and decide with which one you feel pleasant and with which one you feel distressed and then read the following section. 25% – 30% of the participants felt distressed looking at figure ‘A’ and did not feel so with figure ‘B’. The practical benefit of this is as follows. Often a room built at a corner where two roads intersect is of type ‘A’. Naturally distressing frequencies are created in it. Since the building is already constructed it is not possible to make any alteration in the shape of the room. If a cupboard is placed in the corner as shown in figure ‘B’ then the frequencies in that premise change. Draw two figures as shown in figure ‘A’ on a white paper. Paint one pink. Look at each figure for one minute each. Decide with which one you feel pleasant or distressed and only then read the section ahead. Twenty-two people were attending a satsang (spiritual meeting). Their answers in this experiment are given below in a tabular form. * Distress can appear in the form of heaviness of the head, discomfort, fear, aversion, tremors of the body, etc. This will make one realise that painting the premise with the right colours can transform the distressing frequencies from it into pleasant ones. When such a change was made in someone’s house it became so sattvik (sattva predominant) that when a guest who used to drink alcohol in the same house earlier was offered a drink, he vomited it within ten minutes of consumption and said, ‘I don’t know why but today I do not feel like drinking alcohol at your place’. Such changes can at times eradicate distressing frequencies completely and at times only partially. Further information on frequencies generated from various shapes is given in ‘Science of Spirituality: Chapter 8 – Yantra’. I. If the deity of a premise is tranquil then the frequencies there are pleasant. The proportion of both, vital energy (pranshakti) and oxygen in that premise is more. 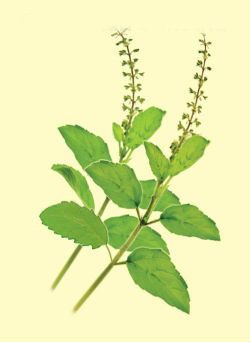 A tulsi plant assists in raising the vital energy and oxygen in the atmosphere. An individual who was visiting us in Mumbai slept on a bed on the first night. After sometime due to discomfort he slept on the mattress spread out on the floor. The following night he had insomnia even on the floor. So on the third night he refused to stay with us. He was possessed by some distressing energy and hence could not tolerate the pleasant energy present in that premise. There are immensely pleasant frequencies in places inhabited by saints such as Swami Svarupanand of Pavas, Gondavlekar Maharaj of Gondavle or at the samadhis (tombs) of saints (e.g. the samadhi of Shri Gajanan Maharaj of Shegaon). 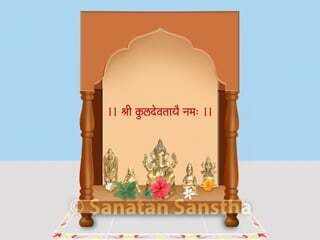 ‘Supreme God, God, Incarnations and Deities’, published by Sanatan Sanstha. Bharatiya Sanskrutikosh. Publisher: Pandit Mahadevshastri Joshi, Secretary, Bharatiya Sanskrutikosh Mandal, 410 Shanivar Peth, Pune 411 030.
. Dharmashastracha Itihas (first and second half). Second edition: 1980, Publisher: Secretary, Maharashtra State Literary And Cultural Society, Secretariat, Mumbai 400 034.
. Shastra Ase Sangate. First edition, fifth reprint – October 1994, Page 110. Vedvani Publications, Kolhapur 416 010.
. Kalpavrukshatali (Swami Muktanandachya Sahavasat). First compilation, 5th August 1986. Publisher: Gurudev Siddhapith, Ganeshpuri, District Thane, Maharashtra 401 206. 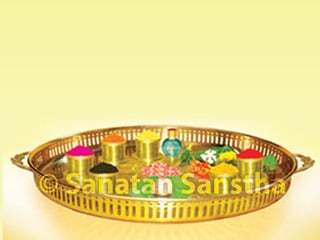 How to arrange the substances in Puja Thali ? 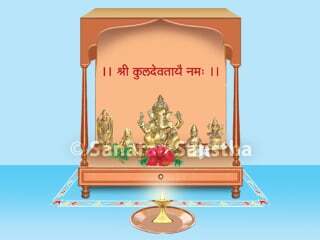 How to perform Puja Vidhi ? How should be the design of Devghar ? 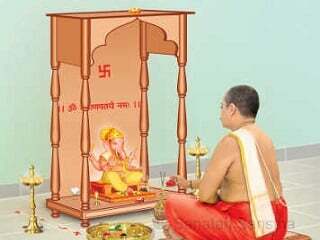 How to arrange the Puja items used in puja ? 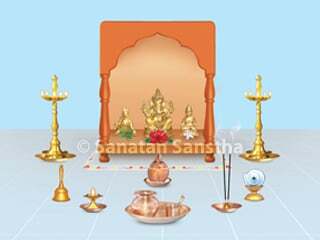 How to arrange Deities in Home temple ? Science of studying a premises. Holy designs made on the ground from white crushed powder. Ceremony / ritual done at the site or foundation of a house.